Why does Jack loath the NZ Police? 7/1/1992……..Britton threatens to kill entire family at Balance St.
7/1/1992 to 16/5/1992…..Intimidatory behaviour similar to what follows. watch our place for about an hour. made a false statement to police. Cops charge him with trespass only then instruct him how to beat the charge but he is still convicted. 19/5/1992…….Further threat to Sandra at Police Station. anywhere. Didn’t keep a record. 18/8/1992…….Watched our home from James’ hill for four hours with binoculars. 25/8/1992……..Waited in vehicle outside our road-gate in dark for some hours. 29/8/1992……..Watched our place from James` hill with binoculars and telecamera. words all four members of our family were liars. act. Again Britton’s denials were believed. warn Britton off. Another lie! several times. See 09 Agent Provocateur. tire marks were fresh in roadside mud. axe. Why then the bag and mode of carriage? 17/2/1992………..Watched with one other from James` hill for several hours. 3/3/1993………….Watched with one other from Speeds for some time. 14/3/1992…………Followed my father in town right on his bumper. right by him saying nothing while Bert filled his car up. 23/3/1993…………Watched our house from road gate for a while. 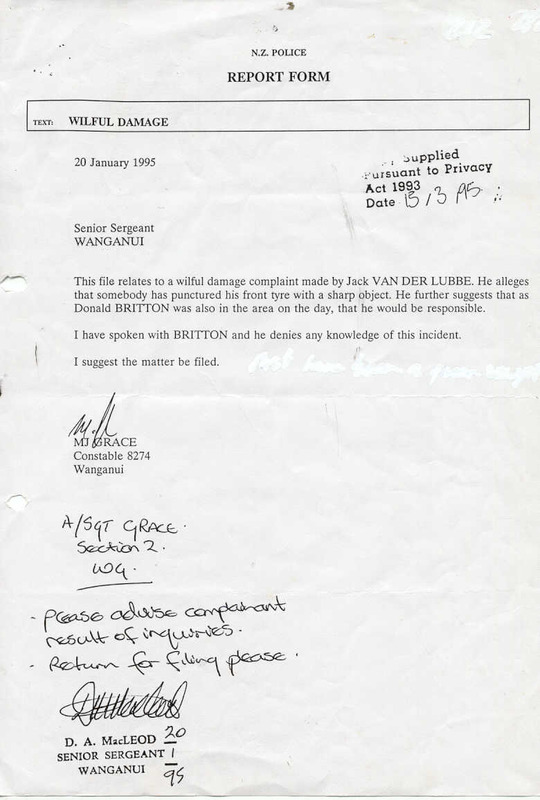 30/3/1993………..Assault on Jack at Court, seen by Brosnahan. 2/4/1993…………Turned at gate with much revving of motor. 9/4/1993…………Watched with one other from James` hill for two hours. 11/4/1993………Watched from James` for some hours. 18/4/1993………Watched from road for about one hour. 25/4/1993………Watched from James` hill several hours until dark. 9/5/1993………Watched from James` hill with one other for several hours. Confirmed by Carole Smith on tape. Police refuse to take a complaint. Upuk for him to bugger off out of it. down) Corroborated by Lindsay Howard. Police do nothing. 29/5/1993……..Pretended to drink from glass as he rode by our place on his horse. 25/7/1993………Pretended to shoot me with a rifle as I drove along Mosston Rd. described but still the police do nothing except call me liar. 8/8/1993………Watched from Speeds boundary with one other. (reluctantly) find the ammo but not the bolt (right next to the ammo). his gun licence was revoked. He got off with a warning. 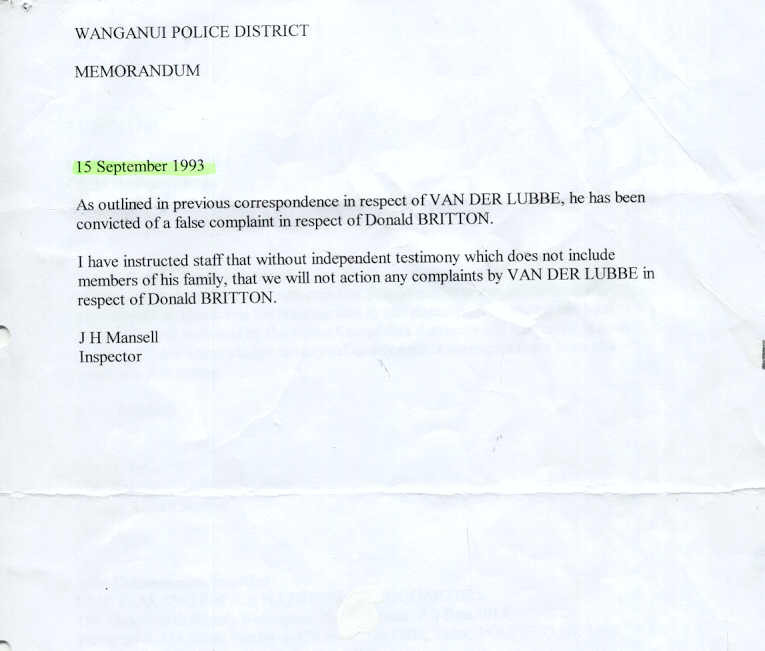 All the following were done after the Mansell Memo of 15 September 1993. 13/11/1993……..Watched from James` hill with five others for several hours. 11/12/1993………Watched from James` hill with binoculars. Duncan McLeod arrives in Wanganui. 1/1/1994…………Did the shooting signal at our front gate. 6/3/1994…………He made as if he was taking photos from our front gate. 16/4/1994…………Watched in dark on horse at front gate. passed by James` bridge in car. 24/4/1994…………Watching in dark by deer jump on Speeds boundary. 10/8/1994………….Watched from roadside for one hour. 21/8/1994………….Rode past with sheet on again. 4/9/1994……………Watched with one other from James` hill. 18/9/1994……….Yelled something to Sandra from James` hill. 27/11/1994………Watched from Speeds with two others. claim against Mars for the damage to our gate. Mars had to pay. are waiting for Mars to arrive at Tribunal. The bloke who fixed the tire “alleged” that the tire had been stabbed with a screwdriver. place. Police tell me it’s a civil matter. 29/1/1995…………Did wheelie in our new drive surface. relating to our dealings with police. shooting signal. Would have been more stabbed tires had the car been empty. going to be dead, fucken dead”. street) “I’m going to take you down brother”. me down, sat on my chest and choked me till dragged off by bouncer. Fucken cops refuse to prosecute. 16/11/1995………..Followed me in car at Springvale. We left Wanganui shortly after. ALL OF THE ABOVE WAS ALLOWED TO OCCURE BECAUSE OF THIS UNTRUE AND UNLAWFUL MEMO. For four months, a Turangi family lived with the fear of knowing their son was being watched. Eric Tai Te Karu had developed an infatuation with the 15-year-old – going to the boy’s house to watch him undress. Te Karu broke into their home on four occasions, going through their property and stealing surveillance cameras used to try to catch him. Yesterday that family, who may not be named, watched as Te Karu was sentenced to eight months in prison, with leave to apply for home detention. The 27-year-old former radio announcer was sentenced in the Taupo District Court on four charges of burglary and ordered to pay $165 in reparation. On more than 20 other charges, including 19 of peeping and peering and two of unlawfully being on a property, he was convicted and discharged. The family said they would not wish what they went through on anyone. The boy’s mother says they are still living with the fear – the nightly ordeal of getting up every few hours to check windows, locks and curtains, even though Te Karu is in jail. The family found out about three of the four burglary charges only when Te Karu admitted them to the police. They also feel their privacy has been violated and believe they may have to move house for a fresh start. The boy’s mother said the first time her son woke her saying someone was tapping on his window, she thought he must have been dreaming. It wasn’t until she saw the man running away more than a month later that she realised something was wrong. The mother started keeping records of when the man turned up but became more concerned when she found a note with “distinct sexual overtones” outside her son’s room. Between September, when the offending began, and December, when Te Karu was caught, the family kept nightly vigils to catch the stalker. She said the family became suspicious of everyone and, in a small town like Turangi, where most people knew one another, that took its toll. Judge Phillip Cooper said he believed the circumstances showed Te Karu was on his way to committing a more serious offence. Te Karu would have counselling for alcohol and personal issues. Defence lawyer Katherine Ewen said Te Karu was making arrangements with his church to move to Rotorua on his release. He was remorseful and ashamed of his actions. At last a decent fine.